GAPC is a unique meeting place for alcohol research, policy and advocacy. The Global Alcohol Policy Conference in Melbourne, Australia is one month away. Starting 4 October, the conference’s theme of “Mobilising for Change – Alcohol policy and the evidence for action” builds on earlier conferences’ translation of evidence into action and recognises the increasing momentum around the world to stop harm caused by alcohol. One month away, there is still time to register for the Global Alcohol Policy Conference 2017 (GAPC). 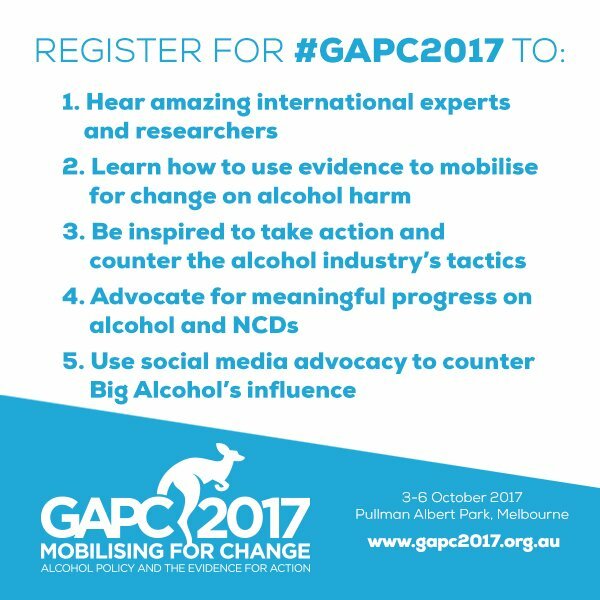 GAPC 2017 will be co-hosted by the Foundation for Alcohol Research and Education (FARE), Public Health Association of Australia (PHAA), National Alliance for Action on Alcohol (NAAA) and Global Alcohol Policy Alliance (GAPA). FORUT is a co-sponsor contributing toward participation from low and middle income countries in Africa and Asia. Speaking on “Influencing those in power” experienced will be shared by Keynote speakers Dr Supreda Adulyanon, CEO of Thai Health Promotion Foundation, Dr Anthony Lynham, Minister for State Development in Queensland, Dr Bronwyn King, CEO of Tobacco Free Portfolios, and Dr Palitha Abeykoon, Chair – Tobacco and Alcohol Authority of Sri Lanka. Alcohol industry tactics and campaigns will be the focus of a session which includes examples from CSR activities in Latin America, Diageo in Ireland, Heineken in Africa and Guinness underage drinking awareness campaign in high schools in Ghana. Being a truly global conference other presentations include examples from the Southern African region, South Africa, Botswana, Zambia, East Africa, Uganda, Tanzania, Thailand, Sri Lanka, India, Chile and of course Australia, the USA and Europe. Lucinda Westerman of the NCD Alliance will hold a workshop on mobilising alliances to advocate for meaningful progress on alcohol and NCDs. Other workshops include tackling alcohol through the New Urban Agenda; analysing competing policy arguments, how to inform policy makers; Foetal Alcohol Spectrum Disorder; winning the battle for hearts and minds; big alcohol and trade agreements; participatory advocacy. Conflict of interest in research, prevention and policy is the focus of a plenary session and will also come up in several of the concurrent session. GAPC 2017 is not open to any person who has a conflict of interest due to financial relationships, direct or indirect, with the alcohol industry. To facilitate regional cooperation there will be regional meetings with report back in one of the latter plenary sessions.